Hula, a dance steeped in rich history and cultural tradition, that to many encapsulates an entire chain of South Pacific islands. Hula dance has become one of the most iconic, recognizable symbols of Polynesian culture. Upon arrival in the Hawaiian islands, passengers are immediately greeted by local ambassadors dressed in long grass skirts and colorful tops adorned with robust leis. They greeted the new arrivals with just a brief tease of hula, almost as if to save some for future experiences throughout the island. Throughout my exploration around the islands I witnessed displays of a rich cultural heritage all around. From the soothing, tranquil Polynesian music playing over the loudspeakers at the shopping malls, to the historical landmarks and statues of integral figures in the islands history, to the displays of dance and other art all around, and their tremendous significance to the islands past and present. Everywhere you go there are dramatic displays of dance and music all about. Starting with a formal presentation at a lush outdoor garden. As a large crowd gathered around a stage set amongst tiki torches surrounding a large koi pond, a live band played classic, traditional Hawaiian music, accompanied by a pair of male and female hula dancers. They would take a moment to give a little history, explaining the meaning behind each song and dance number, prior to the dancers performance. Throughout the show, the dancers continually swapped places to highlight things like courtship dances where the men and women flirtatiously interacted with each other as they performed; then they would quickly swap positions for an all male, or all female routine, where they would tell warrior and other stories through their intricate, graceful hand movements. 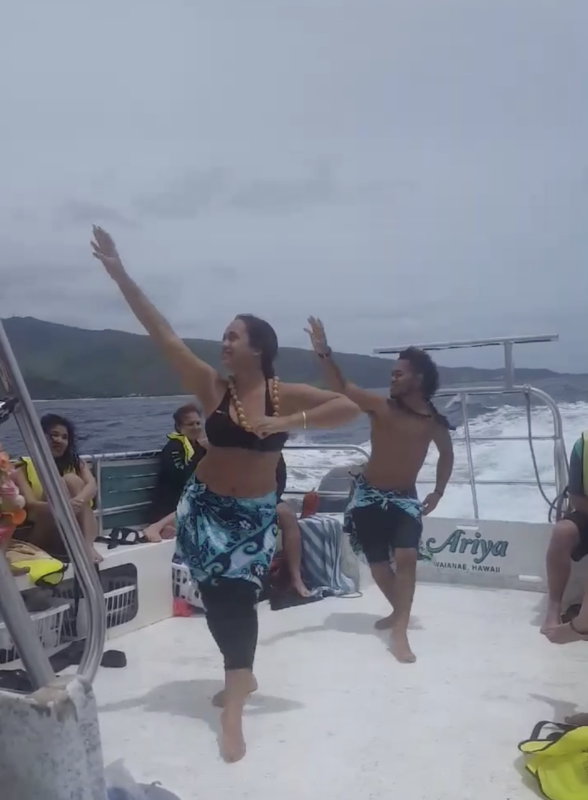 Hawaiian dancers gracefully move upon our shaky, fast moving boat. I was fortunate to experience this colorful display once again while on a dolphin cruise out at sea. As the boats’ engine steamed ahead, the poised dancers amazingly managed to maintain their balance and keep upright while the rest of the passengers struggled just to stand and not get knocked over. They performed beautiful dances in unstable, shaky conditions with the utmost composure and confidence, as if the fast moving boat and thrashing waves beneath their feet weren’t jolting them about! I was honored that the accomplished male and female dancers invited me to join them in a couple of traditional (and not so traditional) dances, which I had to learn right there on the spot. They handed me a colorfully patterned wrap to wear, along with a lei, and had me kick off my water shoes and join them for a crash course atop crashing waves in hula. While my main objective was to avoid losing my balance and bowling everyone over at the next bump in the water, I was also able to mimic a few of the detailed arm movements, and join in the rich storytelling along with the engaging performers. I was treated to an intimate rehearsal by a local dance troupe in a parking lot of a boat harbor! Summoned by the rhythm of echoing drums and hypnotizing chants, I was literally seduced by the sounds of the island, the pulse of Polynesia. As I approached, I witnessed the show of solidarity amongst the circle of drummers, which included a few women playing, and some kids running around. They were accompanied by a troupe of around twenty male and female dancers who performed together a series of fun, flirtatious, high energy movements. Then as the drum beats changed, the dancers split up, women off to one corner, and men remaining in the center, facing the drum circle. The men used their cloth wraps like instruments of war, sharply jousting them about, synchronizing them with their staccato arm swings and thrusting hip movements. You could feel the tone of the dances shift, as men told their warrior stories and the women displayed their own more intense narratives. This powerful practice in the parking lot went on for hours, with the barefoot artists connecting with the earth beneath their feet, the drummers and each other in a deep display of passion and tradition, showing the world the powerful pulse of Polynesia.